Sonus Festival returned for its fourth edition on Zrće Beach on Croatia’s Pag Island this year, for five days of music that features some of the biggest name in house and techno. Ricardo Villalobos, Marco Carola, Maceo Plex, Rødhåd, Chris Liebing, Loco Dice, Dixon, Luciano, Joseph Capriati, Seth Troxler, Jamie Jones, Adam Beyer, Tale Of Us and many more all perform through the week, as a dizzying amount of headline names spin on the Adriatic coast. 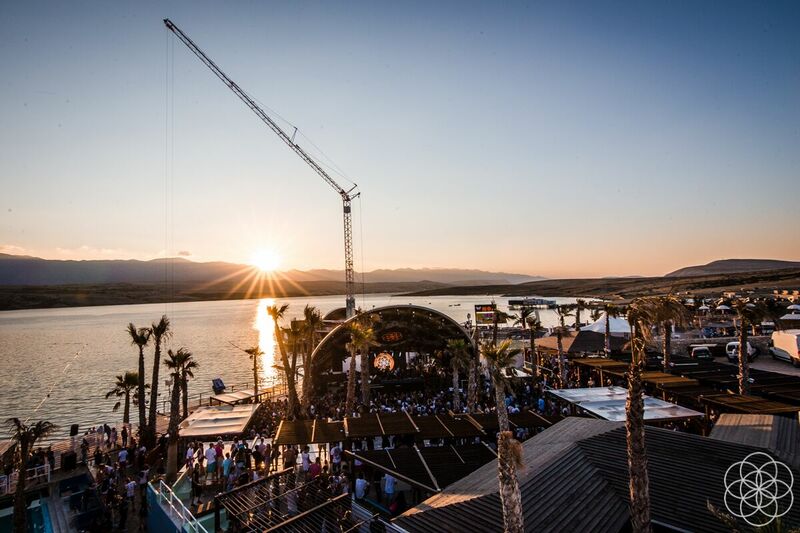 Sonus utilises three venues on Zrće, which also hosts Hideout Festival earlier in the summer. The fact that the rest of the beach operates as normal during the festival can make for a culture clash with bars and clubs playing chart-topping hits when navigating between parties, but once inside, the festival’s spaces are some of the best in the world. Papaya is a huge sprawling space that acts as the festival’s main stage, as well as featuring a pool that hosts their scheduled day parties. Aquarius is a smaller venue with a raised DJ booth that looks down onto a long, narrow dancefloor, which is flanked by tables to one side that steadily rise up to a bar at the venue’s highest point. Kalypso, which was fully refurbished last year, is the festival’s most intimate venue, with the feel of a giant treehouse. Set amongst greenery at the end of Zrce's wide bay, its wide dancefloor means that nobody is far away from its low-slung DJ booth. The first night of Sonus is shut down early due to a violent storm hammering the beach, but from there it’s a week of relentless big names spinning amidst a party paradise. Here’s five sets that stood out above the rest. Apollonia play an all-day long pool party at Papaya in front of a huge crowd on the festival’s first day, with a set that proves just why the trio of Dan Ghenacia, Shonky and Dyed Soundorom have become such a revered name since their inception in 2012. Rising from the ashes of Ghenacia’s Freak n’ Chic label, and having been purveyors of the music they played on the Parisian after-party scene at venues like La Batofar in the late 90s, the trio spin a delirious mix of their druggy deep house and spacey techno. It peaks with the delectable ‘Make Up Your Mind’ from Swirl People, which sees everyone round the packed out pool locked into Apollonia’s cavernous groove. Seth Troxler spins twice at Sonus, including a closing set at Aquarius on the festival’s final night. But it’s his daytime vinyl-only set at Kalypso that comes out on top, providing three hours of house that shifts effortlessly between deep and dubby, through spacey, into slamming acid and back again. Barring some technical difficulties with an off-kilter deck, the slot proves Troxler to be a master of his craft, with various peaks that show what a kaleidoscopic filter of sounds he manages to work through. DJ Pierre’s rework of Chic’s ‘Clap Your Hands’, Floorplan’s ‘Funky Souls (club 246 mix)’, DJ Gregory’s remix of John Ciafone’s ‘Everyday’, Brian Harden’s ‘Where Are You’ and Dilated Pupils ‘Drosophila’ all stand out, but it’s David Morales’ undeniable mix of Photek’s ‘Mine To Give’ that sends the crowd into rapture towards the end of the set, with smiles breaking out across the tree lined venue. Dixon closes Aquarius on the second night of the festival with a four-hour set that’s one of the biggest bookings of an incredibly stacked line-up. But it’s Recondite, who warms up for the Innervisions boss that steals the show with his hour long live set. With four studio albums, the German techno producer has a huge back catalogue of music to draw from, and works a subtly building set laced with dense textures and undulating 4/4s. It peaks with the brooding ‘Warg’ towards its close, which saw release through Hotflush Recordings earlier this year, and sums up Recondite’s deep and sprawling techno sound perfectly. Tini and The Gang round off Kalypso's daytime schedule on Sonus’ last day in front of an under capacity crowd for the first time at the festival, which shows that energy is flagging after five days at the event. Alexandra spins her warm minimalist sounds before the head honcho steps up, taking the pace from the Romanian selector by starting downtempo and spacey, before delicately moving through tech-tinged tracks and finishing on tribal workouts with bags of swing and groove. Those at Kalypso give a huge response as Tini utilises subtle gear changes and near endless mixes throughout the set, without ever remaining static, taking the dancefloor on a journey that is epitomised by the slow burning breakdown of Tim Green’s rework of Mark Broom track, ‘Supersnout’. Ricardo Villalobos plays the final set at Kalypso, at the close of two late parties of minimal sounds that include an all-night long set from Rhadoo b2b Praslesh, and Zip, but it’s when the Chilean master steps up that the packed out crowd truly comes alive. During his set Villalobos seamlessly blends deep, dark, moody but uplifting tracks of texture and percussion in a way only he knows. Throughout he works equal parts darkness and light, whilst breaking out his signature dance moves in a DJ booth packed to capacity. But it's early in his set the heaving dancefloor can get truly lost, with the deep sounds of Sascha Dives’ ‘Funky Rhythms Seduction’ a standout.